A familiar question arises about the Gospel of Jesus Christ, which is how will those who have never heard the Good News be saved? After all if you have never heard the story of redemption and accepted Jesus Christ as your Savior how can you be called redeemed and Holy in God’s eye? The Bible simply states that those who have never heard the Gospel of Jesus Christ will be judged based simply on their personal sense of right and wrong or conscience. We must remember that God is just in all that he does, (Revelations 19:1-2) especially with those who have never heard about Jesus. The Lord is always prevailing on our behalf to become saved and spread the Gospel. Even in this modern information age at times the Christian message can be missed, by some in third world and communist countries. This news is very comforting, even for me at times who struggled with finding an answer for the rest of the world not fortunate enough to have been born in a free society. This can also be related to those in other religions, who have never heard the Gospel but follow a religion which teaches wholesome living. That goodness will be used to reveal Christ to the unsaved upon the Lord’s return. This is not to say those who have heard but rejected the Gospel will be saved but those who have NEVER heard and still have a still moral sense of being. The Bible speaks of the Anti-Christ commanding an army in a war against the saints of God. There is little information who this army will consist of, or how exactly they will aid the false messiah during the Apocalypse. Though we are given little information, we can conclude that this group of people will be extremely rebellious free thinkers, seeking to do away with anyone who represents Jesus Christ. Though we can make assumptions, the scripture does provide us with a group of people who were rebellious in their day and sought to please themselves instead of YAH (God). This group of people were the seed of Cain, the offspring of the Serpent and Eve (Genesis 3:13, read The Serpent Seed blog under The Unfamiliar Bible Facts tab). 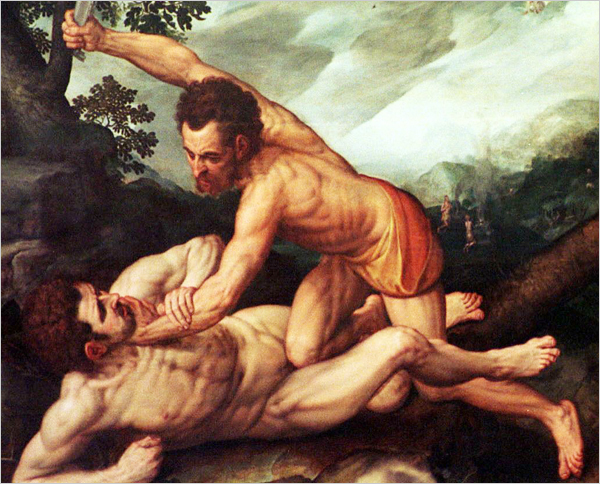 Upon the murder of Abel, Cain relocated to the land of Nod (long presumed to be Eastern Europe). In this land Cain started the first civilization, the City of Enoch, dedicated to his rebellious desires. Cain in his knowledge of who he was (a by-product of the Serpent) felt that he was equal to God, thus creating his own kingdom of Earthly pleasure. In the City of Enoch, the sons of Cain became the most rebellious people in the world. Cain rebelled against every law the Lord intended for his creation to obey. In Genesis 4:17, “And Cain knew his wife; and she conceived, and bare Enoch: and he builded a city, and called the name of the city, after the name of his son, Enoch.” The term “knew” used here has the connotation of cohabitation (1 King 1:4), meaning they did not marry they acted upon their lust and a child was born. The Sons of Cain, produced the first polygamist in Lamech, Genesis 4:19, “And Lamech took unto him two wives: the name of the one was Adah, and the name of the other Zillah.” The first person to create and manufacture weapons in Tubal Cain, Genesis 4:22, “And Zillah, she also bare Tubalcain, an instructer of every artificer in brass and iron: and the sister of Tubalcain was Naamah.” The term here “Instructor” is Hebrew for “Latash,” meaning to sharpen (1 Samuel 13:20) and artifact is translated “Choresh” for metal arts. Cain’s sons also created music to glorify themselves, Genesis 4:21. The offspring of Cain represent the warmongers of today still promoting their sinful nature in rebellion against God. Through the knowledge of the Serpent they have always deemed themselves in the same high esteem as God, choosing their own will instead of His.